Sprinters, GC riders, and opportunists alike agreed that a long, flat stage made for a boring day of racing. CHARTRES, France (VN) — A showdown between emerging sprint stars Dylan Groenewegen (LottoNL-Jumbo) and Fernando Gaviria (Quick-Step Floors) concluded stage 7 of the Tour de France with a few moments of excitement — but only after six long hours of hardly any action whatsoever. Sprinters, GC riders, and opportunists alike agreed that the distance and flat terrain made for a boring day on the bike. The 231-kilometer trek from Fougères to Chartres featured just one official climb, a fourth-category ascent crested over 100 kilometers from the finish. Bora-Hansgrohe’s Peter Sagan was not impressed with the parcours. Movistar’s Alejandro Valverde, who has raced over 160 Tour de France stages in his career, felt even more strongly about this less-than-thrilling day on the bike. “It’s too much. A 230-kilometer stage, it doesn’t make any sense. But it is what it is,” he said in a finish line TV interview. Yoann Offredo (Wanty-Groupe Gobert) at least made an effort to liven things up attacking multiple times early on before his solo breakaway stuck. His escape lasted for around two hours before it was inevitably reeled in. Groupama-FDJ’s Laurent Pichon then gave it a go, but he had never had much of a chance against the stable of WorldTour sprint hopefuls in attendance. Unsurprisingly, the pack closed him down as well. Groenewegen led the peloton through the finish in a long line, with 118 riders all coming home on the same time. Over six hours of racing yielded no time gaps for any of the major GC hopefuls. 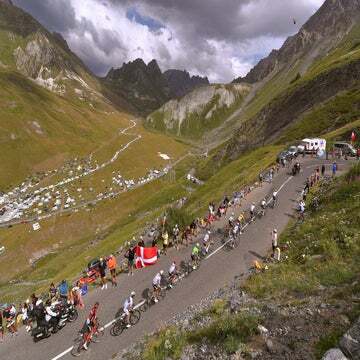 Although the 2018 Tour de France was always risking criticism of early boredom by keeping the first week free of any major climbs, the length of Friday’s stage seemed to tip it into especially risky territory. Flat stages without much action until a sprint finish are one thing, but stage 7 challenged TV producers to fill hours of airtime. Commentators had to be thankful that the stage finished in Chartres. Helicopter shots of the world-famous medieval cathedral offered a few minutes of respite before the focus returned to the inaction on the road. Groenewegen will at least come away pleased from the stage, having won his first stage so far this Tour. Perhaps it’s to be expected that he’d shine after 230 kilometers. The Dutchman also has a penchant for one-day racing and doesn’t mind a long day on the bike. Indeed, the top finishers on the stage all share that in common. Runner-up Fernando Gaviria (Quick-Step Floors) aspires to make his mark in the classics, while third-placed Sagan and fourth-placed Arnaud Démare (Groupama-FDJ) are both monument winners. Another monument winner managed to find a positive takeaway in the seemingly interminable seventh stage. BMC’s Greg Van Avermaet, currently sporting the race leader’s yellow jersey, weighed in on the stage length after the finish — although it was hard to tell whether his opinion was an earnest one, or perhaps a bit tongue in cheek. 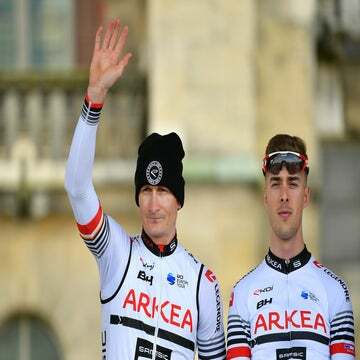 Riders may have a chance to continue their conversations on Saturday, where another flat parcours awaits, although at least stage 8 is 50 kilometers shorter. Fans finding themselves nodding off should be sure to set their alarms, however, for Sunday. No one is quite sure what to expect for the cobbled ninth stage, a mini-Paris-Roubaix, but “boring” is one thing it almost surely will not be.